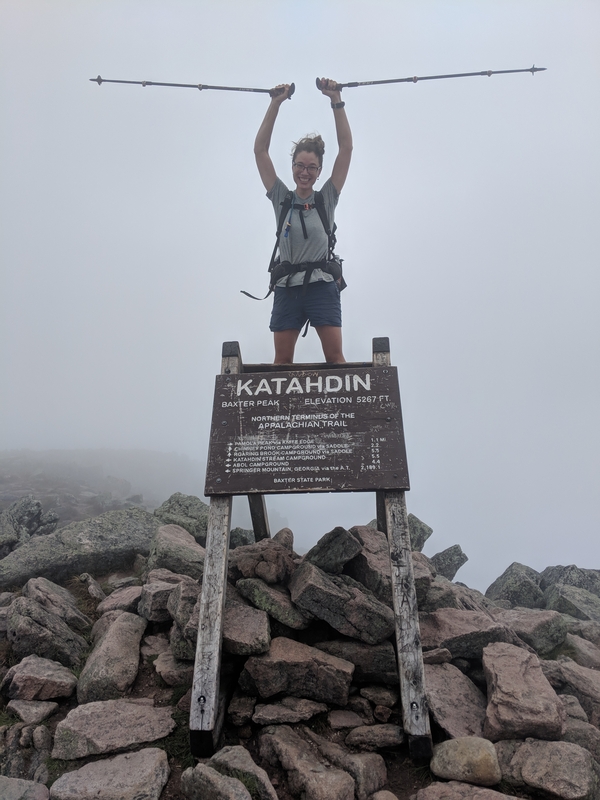 In the three-ish months since I summited Katahdin, I have tried to find the words to talk about what my thru-hike has meant to me. And in this, I feel like a failure. So here’s the long and the short of it: my thru-hike taught me that my life is driven by contradictions. And those contradictions can’t ever be smoothed out. When I fight them, I struggle. When I embrace that contradiction without forcing it one way or another, my life–chaotic as it may appear–makes sense. I don’t just survive. I thrive. This was not some kind of thunderbolt epiphany. It was a reality I lived for roughly 2,000 miles of my 2,190.9-mile thru-hike, and a reality that I cannot seem to shake now that I’m off trail. I’m sure other people can give you nice, tidy narratives with beautiful morals and lessons. I just can’t seem to tie it up in a nice bow. So. What do I mean by contradictions? I saw hikers who rushed through Maine to try to finish by a particular date, or before their money ran out. I saw hikers who seemed to slow more and more the closer they got to finishing, wanting the experience to never end. I was neither type of hiker. My body desperately wanted me to be done. Though I learned how to manage my feet, my body wanted me to be done three months into my hike, and it took me 5.5 months to hike the whole trail. So for 2.5 months, I attentively managed, meticulously treated, cajoled, begged, and pleaded with my body to keep working. I think most of my previous posts document this: I developed nerve pain, then nerve numbness. I named my feet. I had to scale back every expectation I had of how my hike would go and simply be thankful I could keep hiking. This meant that I constantly physically craved rest. My feet screamed at me every day to be done. By the end, nearly every part of my body did. After the big scary weight loss in Virginia, my hips remained so bony that I had more or less constant bruising from where my pack sat. These bruises wouldn’t go away until I’d been off trail for a couple weeks. Over the duration of my hike, my feet seesawed between excruciating nerve pain and total lack of sensation. Neither was helpful for hiking over difficult terrain, but it’s what I had. So I hiked and camped in a steady state of managing constant pain and the threat of injury. I took more breaks than any other hiker I knew, because my feet simply wouldn’t go for hours without respite. I didn’t dare take more than two zeroes at a time because I feared that any more than that, and my body would think it was done and just totally stop working. This fear turned out to be reasonable. A few days after I finished, my knees swelled and my feet hit epic levels of nonfunctioning. I finished the end of August, but by mid-September I couldn’t really walk and I spent the end of September and nearly all of October in a boot to aid my left foot’s recovery. I could not eat enough, ever, by the end. In Vermont, New Hampshire, and Maine, I carried obscene amounts of food, forced myself to eat almost constantly, and even then barely stopped my body from dropping to dangerously unhealthy levels of weight loss. I was carrying and consuming roughly twice as much food as most other hikers I knew. They gained; I lost. I look at the photos I took of myself those last few weeks and I am achingly thin. I remember how brittle my body felt at times, how weird it felt to be in a body that, for once, didn’t have solid hips and thighs. I had come to hate food because no matter how much of it I ate, my body always burned it off. I was exhausted. 5.5 months of all-day exercise every day and managing chronic overuse injuries will do that to you. At the same time as this bone-weary exhaustion, though, I did not want to be done. I found a sense of calm and a freedom on trail that I’d only glimpsed in broken pieces throughout my life. I fell in love with the rhythm of a thru-hike day, with the strange liquid sense of time I had on trail, with the camaraderie with fellow hikers, and the feeling that I was doing something once-in-a-lifetime and epic. I liked the hours alone with my mind, watching it like an amused parent watches a child making up games to amuse herself. I made a weird kind of sense out here. I knew what every hiker who slowed down knew: that nothing was ever going to be the same. And that I would spend every day after my hike heartbroken that I wasn’t on trail. Except I couldn’t slow down, because of my feet. So I walked this weird line of just maintaining a steady pace, a steady rate. I longed for zero days but felt antsy and worried as soon as I had them. I missed friends and family but as soon as I saw them, I couldn’t wait to get back on trail to finish what I’d started. I had a task to complete and my feet made me constantly aware that I might not complete it. So. I kept hiking. It seems so simple, to lay the contradiction out like that: every fiber of my being both needed to stop and needed to keep going. But it’s true. That contradiction has followed me into off-trail life. Though I had no job, no place to live, and no real plan when I finished trail, in the three months since then all of those things have fallen into place. And every time I start to feel panicked and stretched thin, some trail magic falls into place and things smooth out again. I have complete and utter faith in my own abilities, but I also have that faith in the trail, even though I’m not on it every day: if I will a solution to appear long enough, it does. My life fits me now in a way it never did before I started my thru-hike. I am happier now, I think, than I have ever been. And yet, contradiction: I am also heartbroken, every day, that I’m not on trail. I suspect I will be for the rest of my life. But I would not trade that heartbreak for anything in the world. Because I could not be who I am without it. Because my thru-hike saved my life, in a lot of ways. It boiled me down to my chaotic, contradictory essence. In a life in which I carried everything on my back and was constantly trying to minimize weight, I also always carried things because they might help other people. Extra first aid supplies. Extra duct tape or Leukotape. Food that I didn’t want to eat but thought would be a great-pick-me-up at a shelter or for a struggling friend. I have always considered myself a hard-nosed, efficiency-focused, process person. And that kind of efficiency would seem to lend itself to the most ultralight of gear decisions, with no luxury items. And yet. I gave, always, when other hikers needed things: food, first aid, help fixing a broken thing. I shocked myself in that generosity. It turned out I didn’t mind carrying a little extra weight if it meant I could help someone else. Bizarre. It is easy, after your hike, to forget how hard it was. How painful it was. How many moments in a day were excruciating, or tedious, or wildly uncomfortable. But it’s also true that if it weren’t for all that adversity, you wouldn’t love it so much, either. I told a friend, once, when we were hiking a series of winter mountains in New Hampshire on a frigid, snowy day, that I felt that I was like a mountain hike: brutal, difficult, but with occasional amazing moments that hopefully made it all worthwhile. I know now that I am actually the weather on the mountain: I can be frigid and brutal, punishing and harsh, but also warm, gentle, playful, encouraging. And I am all of those things at the same time. The less I try to label that, and define it–the less I try to cast my thru-hike experience or my sense of self in stone–the better this life is. I suspect this is my final post specifically about my thru-hike. I suspect it is anticlimactic. But what did I learn? That I work best with a certain amount of chaos, and if my life gets too orderly, the chaos will find me anyway. That I can be–and pretty much always am–fierce and fragile at the same time. That sometimes stories do not have a clear beginning, middle, or end: like the AT, they can take the long, winding route; they can double-back and triple-back; they can leave you feeling trapped and claustrophobic and expansive and effusive. And that for me, a good life is one in which all those things happen every day. My hike was nothing like I thought it would be. It was a far better hike for it. And I am a better person for it. Hi everyone, I'm Sassafras. I grew up in the rural Midwest, spent some time in Michigan's Upper Peninsula, and have hopped around the Mid-Atlantic and New England the last few years before settling in Maine. I'm a hiker, writer, and triathlete in my mid-thirties, and I do a lot of whooping at races and on the trail. I'll be taking a break from software product management to hike the AT NOBO starting in March 2018 and doing my best to make #hikerswithsass a compliment. Great post! Reading this makes me very anxious and very excited for my hike! Haha well that combination of emotions would be in keeping with my experience! Don’t worry. Being out there is, in many ways, the easy part. I mean it’s way more physical discomfort and adversity than a lot of us face in off-trail life, but it’s also a very simple life. You’ll settle into it and hike your own hike and it will be awesome! So very well said. You’re such a fine writer. Enjoyed your article, thank you. Sounds like you need to go on another thru hike soon.